This blog does what it says on the tin. 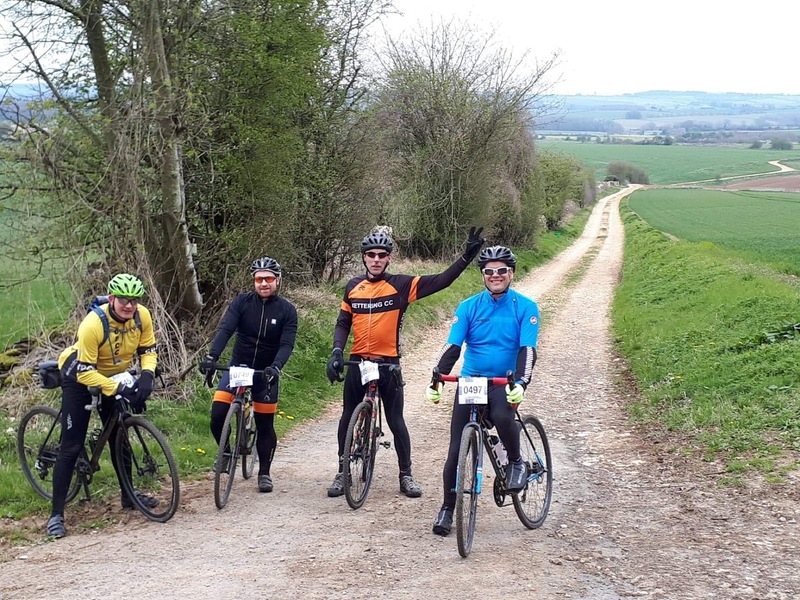 It's about riding bikes, mostly in Northamptonshire. 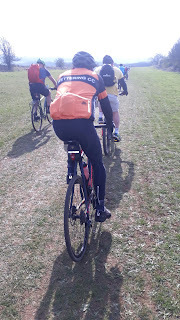 I ride road bikes and off road bikes, sometimes I go out solo, sometimes with C&DCYCLES cycling club and sometimes with my kids. I ride for for fun, fitness and because it's good for my soul. I started this blog to record 2014 as a whole year of cycling. I've loved blogging my exploits and it seems others like it too, so by popular demand I'm going to just keep going! Happy Pedaling! On Sunday the 14th of April it was time for the 2019 'Hell of the North Cotswolds!' This is an absolute beast of a ride in stunning surroundings and if you're looking for a challenging ride next year I cannot recommend this highly enough. The following blog is a tale of my personal struggle, the camaraderie of cycling mates and a very well organised off road sportive. Let's unload my personal stuff or what the unkind would call 'excuses.' My plan post Christmas was to get in to tip top shape by the time of this ride. 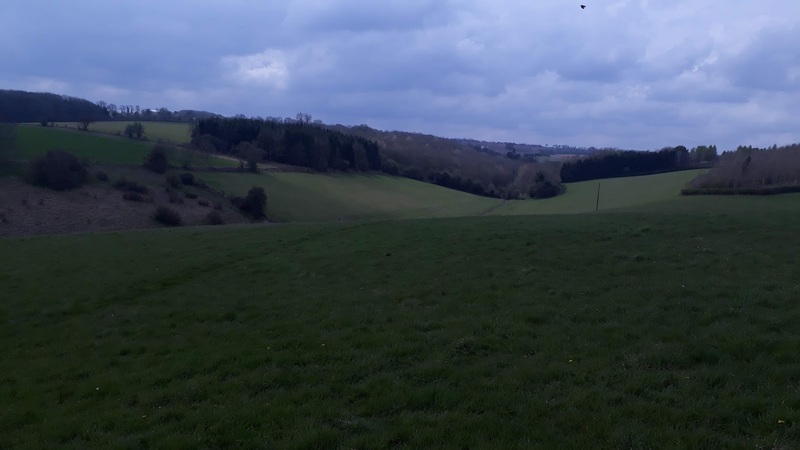 I knew it would be tough and getting down to a sensible riding weight and getting miles in my legs were my two objectives. Last year I'd shed two stone post Christmas and was the fittest I've ever been on a bike. So it would be easy eh? Well no. Life doesn't always work like that. 2019 started with a lot of loss. My Pap (Granddad,) died, then Harvey our beloved old Labrador died, I am if I'm honest still a little post traumatic from my car crash, it's a big year with the kids (Niamh takes her GCSEs,) and other massive things, like my father in law having cancer are bubbling along. My stupid solution to all of this is to try to batter my way through it. I've worked too hard and allowed work stress to really get to me. 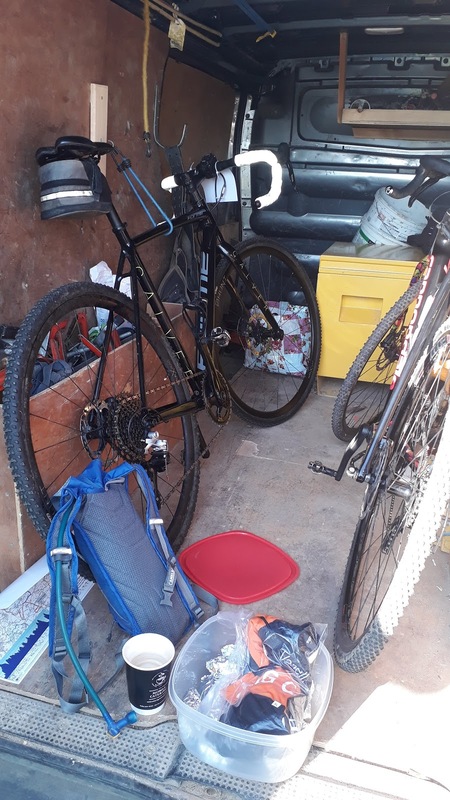 I'm also taking too much on with my evening activities and having said I don't have time to cycle in the evenings I have found myself out of the house 3 to 4 nights a week. In amongst this I have managed good stuff. I have lost a few pounds since Christmas but nowhere near enough. I ditched dry January but then managed alcohol free February and the first week of March. This was followed by 'have a few pints every day it won't hurt will it.' (Yes you flipwit it does!) I've also been eating emotionally! I resist everything offered to me at work, everyone says 'ooh aren't you good,' and I reward myself by eating anything I can find in the house when I get home! To top it all I was on annual leave last week and I've been ill with a cold all week! I never get ill. I have a badge on my lanyard for not missing a day of work in 2018...it's like my body relaxed and then said "I'm shutting down now, you've pushed me too hard!" So I arrived at Sunday, the day of HONC, in nowhere near the shape I wanted to be in. Excuses concluded! Leading up to the ride we've had a healthy messenger group running and much excitement was in the group. Through that group I arranged for Ian Bird to pick me up in his well equiped van. At 6am Ian arrived and we loaded up. 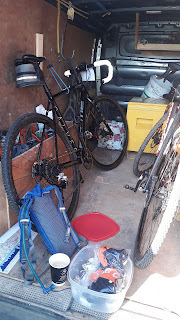 I prepared the day before, having decided I'd use my Forme Calver CX for the ride. I hated fitting that saddle bag but I'd need to carry more than usual. In my camebak I had a homemade sports drink of 50:50 orange juice and water with a teaspoon of sea salt. The queen of cakes had also prepared some excellent ride snacks of peanut butter snickerdoodles https://www.crazyforcrust.com/peanut-butter-snickerdoodles/ and chocolate chip flapjack. Finally I'd also packed my portable charger because I didn't trust my Lezyne bike computer or my phone! 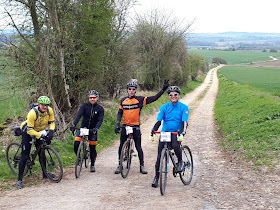 We made it to the event base at Winchcombe in good time to get a coffee in and meet our ride mates for the day; Chris B, Olly, Andy B and Gary. Ashley was there somewhere too but we didn't see him all day so I hope he had a good ride. The young whippersnapper is too quick for us all anyway so he needed to do his own thing. At the start we discussed plans. Everyone wanted a crack at the 100km route but also we agreed to be realistic. 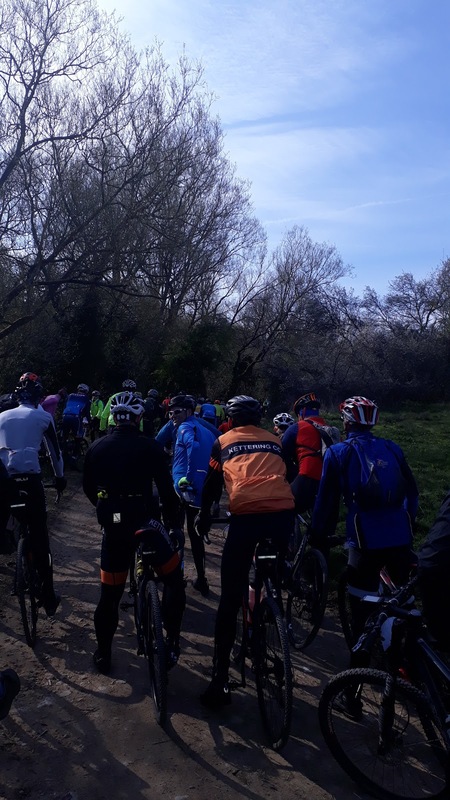 The route had been organised with a cut off so you had to drop to the 75km route by 14.30 or if you were really suffering dropping to the 50km was also possible. Chris was not feeling too optimistic having had a lack of training time. Even more amazing was Olly. He'd broken his ankle some weeks ago but hadn't fully realised at the time and the bone healed itself whilst he remained mobile! 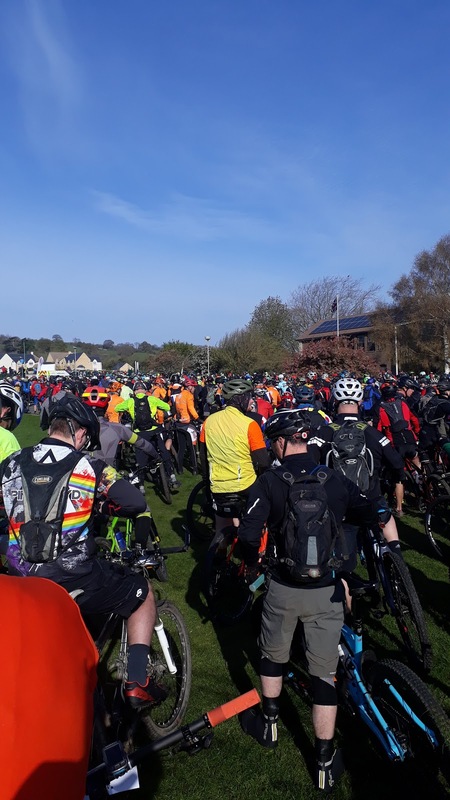 It was a mass start at Winchcombe which was initially exciting. It became a bit annoying on the first climb because the track was too congested and most of us had to get off and push up the hill. However the atmosphere was lovely, everyone was chatting, asking where we were from, had we done it before etc. The was a real mix of MTBs, CX, a couple of tandems and a massive age range of riders. The weather may look nice in the pictures and the truth is, it was a dry sunny day. It was also very cold with a sharp wind at times. Never the less our group was in fantastic spirits for the first third of the ride and we even had a good old sing song. Queen hits to the fore, some telly theme tunes and here's one for my good friend Mark Coleman - Gary knows all the words to the TV theme tune for Super Gran! Gary is not just a singing maestro. He has the worlds largest calves as demonstrated by his leggings bursting at the seams. The hills were really mounting up. I was glad I was on my CX bike because it does climb better than my MTB, especially on the road. The only advantage an MTB would bring is the downhills, some of which were a bit hairy without suspension. Thank goodness for my tubeless maxxis, I would definitely have had a pinch flat with tubes. We made it to the first food stop at 50km, Chris was absolutely wrecked at this point. I did not feel much better but tried to hide this from the others because I really wanted the 100km. My Lezyne as predicted was nearly out of battery and my phone seemed to be draining faster than usual. No matter I had the power bank...then I discovered I hadn't got any leads. Luckily Gary had a spare mini USB and the day as far as my Lezyne was saved. My phone showed 39% so I put it into power saving mode which proudly announced 8 hours of battery life, more than enough! Chris asked us to leave him at the food stop and he would make his own way back. So the five of us proceeded with the 100km route. I was feeling rotten but wanted to push through it. The first hill after the stop was an absolute beast. I knew I was done at this point, especially as the route split for the 75km was just after that hill! I had some moments of doubtful regrets and then decided that I would drop to the 75km. Olly, Ian, Gary and Andy headed off on the 100km route. At this point I should have taken Ian's van keys but I was worried they'd get back before me! As I pushed on I could feel twinges of cramp coming so I got off and pushed up every hill! As it tuns out I was actually going faster walking than a lot of people riding up the hills. The scenery remained stunning and I started to feel a bit better going at my own pace. Throughout the day we had been riding with this family. Dad, Ian Alexander and his daughter Taryn completed the 75km route on this tag along. It was a a beautiful 'hack,' of an MTB e-bike with a hybrid bolted onto the back. 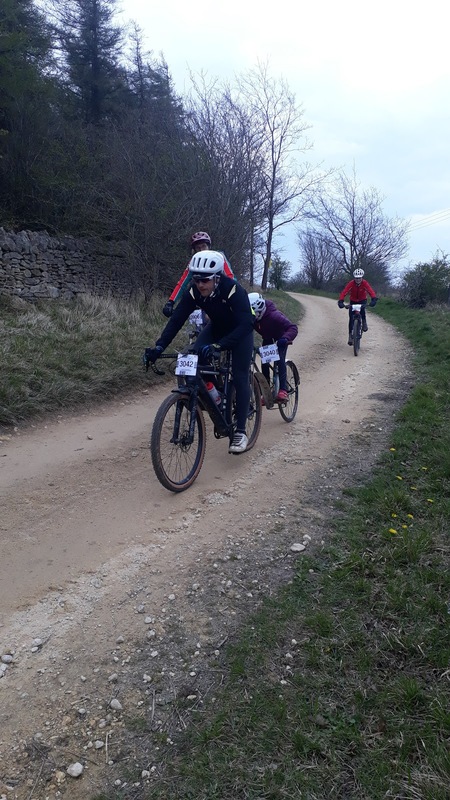 Taryn was exceptional fun with the other riders and I think Ian, even with the electric motor power boost, is a legend for tackling HONC on this and even more so for having the skills to create such an excellent bike. I arrived at the finish at 15.00 and Chris rolled in about half an hour behind me. We waited together for the others to arrive. 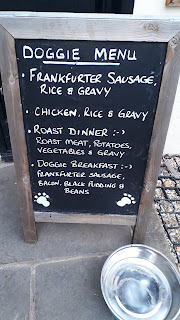 It was a bit of a long wait as they didn't get back until well after 17.00. My phone died just moments after the finish and I had just enough juice to upload my ride. I couldn't use the power bank because my phone is a USB-B...of course if I had the van keys...Ian had one in the van! Chris kept me company and as it was freezing we sought the sanctuary of his van. After a lot of road watching Gary was the first to come steaming in, looking like a man with fresh legs. 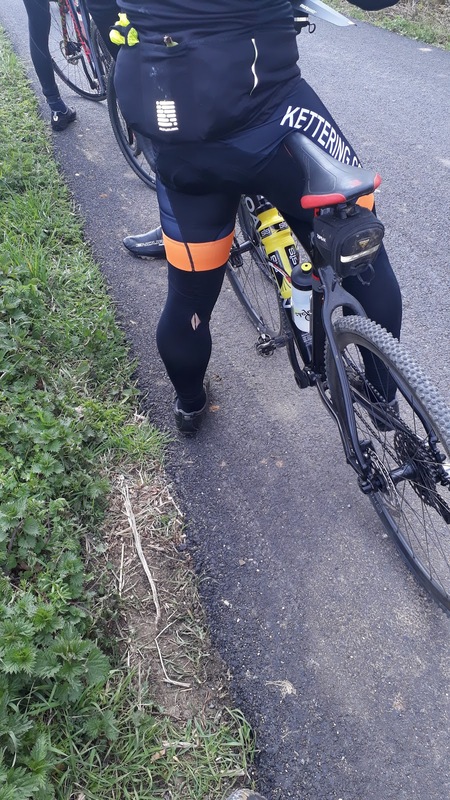 He announced that Andy and he had pushed on together but as Andy's Garmin had failed to start for the first 5km he had gone back to make sure that bit was recorded. How fit is Andy B! The man is just a mountain goat!! Then came Ian and finally Olly rolled in. His was the 'ride of the day,' as he had soldiered on and suffered where I just couldn't. 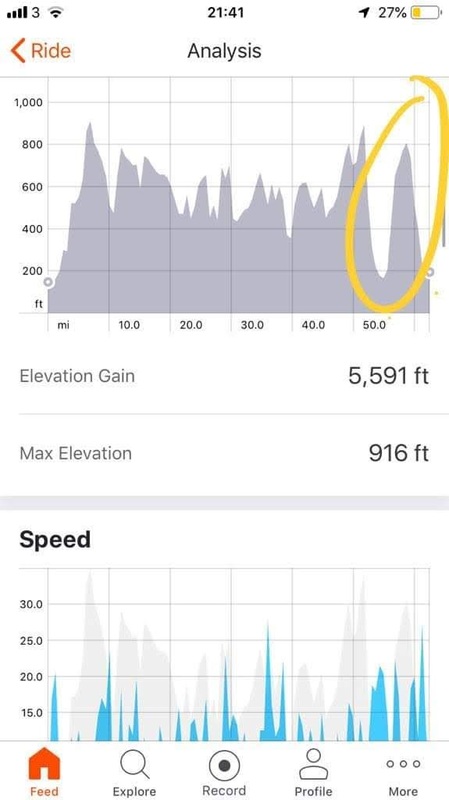 Just look at the ride profile as pointed out by Olly. By dropping to the 75km I had missed out on that final ridiculous hill. Again Chapeau to the four in our group who completed it. Am I truly disappointed though? No I'm not. I the cold light of day I realise that I'm not unfit, just not AS FIT as I want to be. 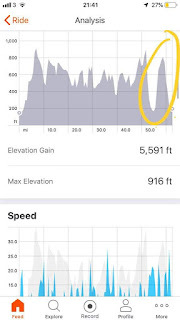 My 75km is a similar distance to a hilly road ride I did last week in Northants. On that ride we climbed 1,800 feet, yesterday on a mix of on and off road I climbed 4,100 ft! That's not far off the height of Ben Nevis! On the way home we stopped for a well earned pint. 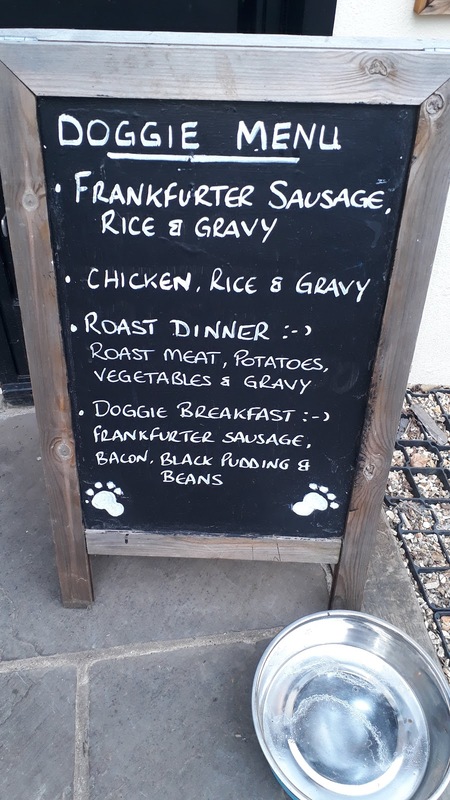 This pub catered well for dogs but we all agreed a dog bowl of this would be very welcome right now. On arriving home, I was shattered and in bed before 10! 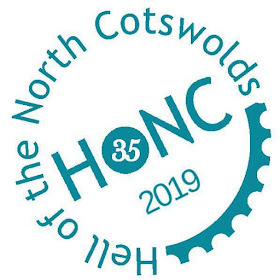 it was my first time riding in any cycling event and started with the HONC despite living in Winchcombe for 20 years ! Cheers for the reply. Glad you had a good day! I think you guys were near us at the feed stop as I heard cries of “anyone got a mini USB?”, and I rode out from the stop just in front of the group containing said ebike with tag along. Fair play to you for completing. I had to take a shortcut back as I cramped just prior to the stop and couldn’t shake it off. Not being able to bear any force on one of my legs was very difficult without clipless pedals! Still a great day out on the bike though, all be it cold, and a memory I won’t forget in a hurry! Cheers for the reply. Unlucky on the cramp. I suffer horrendously sometimes. Better luck next time. Sorry mate, cheers for looking though! Great review of the ride, my first one, I had initial intentions of the 100KM but these were slowly disappearing when after the split from 50 to 100 I realised we'd only done a shade over 12 miles!!. Most of that felt up hill. 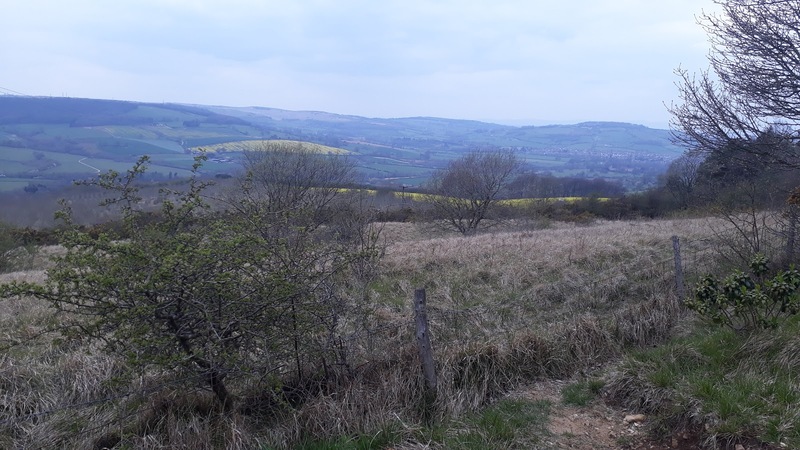 A really challenging ride - my two day's commuting to work and a 16 mile ride around Cleeve hill were not sufficient preparation for this beast. But I didn't walk, managed to ride each hill (slowly) and despite thinking at the finish (75km) - never again!, on reflection, I'm now thinking about next year. Training starts now...All the best. See you next year, cheers for reading!